Elegant and always in fashion - gold! 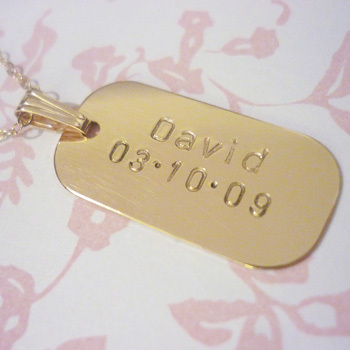 This hand-stamped 14kt gold-filled tag necklace is personalised just for you and features the name and date of a special person or occasion. However you are not limited to this and if you have a favourite short motto or couple of words you'd like to wear close to your heart, we'll do our utmost to accommodate your request. You can also add Swarovski birthstone crystals as an optional extra - pick yours or your child's birth month, perhaps a month of remembrance or simply a favourite colour. Gold-filled jewellery is an economical alternative to pure gold that is a solid layer of 14 karat gold permanently bonded to an internal metal. It is NOT the same as the lesser quality gold plated jewellery. Under normal wear and with the reasonable care that you would give any precious metal jewellery, 14kt gold-filled will not peel, flake, or wear off. It's tarnish-resistant like solid 14 karat gold and is safe for most people with sensitive skin. A gold-filled piece of jewellery makes a long-lasting and worthwhile investment.